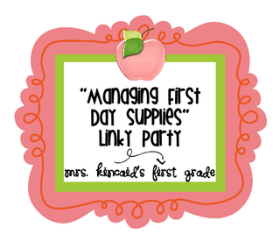 Mrs. Kincaid is hosting a linky party, come join! She is looking for ideas to help organize the supplies students bring in the first day of school. At my school we send home a supply "wish list" with each student at the end of the year. For example, myself and the other second grade teachers wrote a letter and created a list of items we would like each student to bring in. Our list went home with the first graders (who will be in our classes next year). In our letter we wrote that all supplies being donated were going to be "community" supplies and shared within the class. Even though my students have desks and their own supply boxes (if they bring one from home) I store supplies in a tub in the middle of the cluster of desks. Any supplies I give to students go in the tub and are shared. If they bring in supplies for themselves they keep them in their desks or backpacks. One of the best ways I have found to organize all other things is with numbers. Instead of writing students names on things, I put a number and assign each student a number. At our school we have a lot of families that come and go throughout the year. When students leave and new ones come I don't have to get new supplies or classroom materials, I just give them a number. I make a set of 25 of everything so I am always prepared for a new student to arrive.